For Faraz’s birthday dinner, tonight, I made this chicken taco twist. 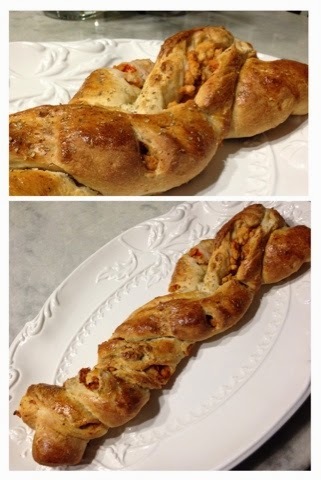 I saw this idea for a twisted bread sometime ago, I think on Pinterest, and changed it up to my liking. Cut them as small or large of a serving as you would like. I doubled the recipe and made two twists today. Season your ground chicken with black pepper, garlic powder, paprika, cayenne pepper, and chili powder. Cook it over medium heat before adding in the [low sodium] taco seasoning. Mix well. Add in the diced bell peppers [I used red and yellow ones today] and mix it with the chicken for a few minutes before removing it from the heat. Preheat your oven to 350 degrees. Line a baking tray with foil [for easy cleanup]. Meanwhile, with the french bread dough: score the top from one end to the other [in both loaves]. Next, using your fingers, spread open the dough a few inches to create an indent in the middle for the filling. Add in the chicken mixture. Now, using your fingers again: pinch the dough together to closing around the mixture completely. Repeat the process with the second bread. Transfer both loaves onto the lined tray [seam side down], one next to the other. Next, twist the two bread dough with one another as if you were creating a braid. Brush on the beaten egg on top of the twisted bread. Create score marks/slits on top of the bread dough [for ventilation]. Bake in your preheated oven, for about 30 minutes. Or until the top is golden brown and the bread is completely cooked through. Since I was making two sets, I repeated the process of steps 4-9 a second time. For dessert, I made [individual-sized] chocolate frosted “donut” cakes.